Chef Zach Pollack (Alimento) will open Cosa Buona in Echo Park. Expect Italian-American fare like eggplant Parmesan. Cosa Buona, 2100 Sunset Blvd., Los Angeles, CA 90026, no phone. In Echo Park, the new street level café is serving locally roasted coffees and offers curbside pick-up --- ideal for anyone passing by on their morning commute. There are breakfast, lunch and dinner menus. In the morning, bagels and lox, white chocolate French toast and omelets reign. Later in the day, choose from gourmet grilled cheese sandwiches like a BrieLT, seasonal salads, wraps and “patortas” –-- a panini/torta mash-up. Desserts include brownies, pies and puddings. street level café, 1166 Glendale Blvd., Los Angeles, CA 90026, 213-413-2233. The space in Silver Lake formerly occupied by Koda is now under new ownership and has reopened as Kombu Sushi. There's a solid sushi menu plus udon and soba. Izkaya small plates range from agedashi tofu and dynamite mussels to tempura soft shell crab and miso-glazed black cod. Drinks include sake and Japanese beers. Consider sitting on the patio. Grill Concepts, Inc., the company behind hits like The Grill on the Alley and Public School, will open seafood-focused Laurel Point on August 1, 2016. The Studio City space occupies a prime address on the second floor of Laurel Promenade --- it was home to the Daily Grill for more than two decades. Expect sushi, oysters and cocktails with fresh juices. Laurel Point, 12050 Ventura Blvd., Studio City, CA 91604, 818-769-6336. Downtown denizens are flocking to BrunchDTLA, a new and inexpensive food court stall serving up global breakfast, brunch and lunch items. Diners will find a bibimbap burrito, a kale corn burger and cauliflower stir-fry on the menu, as well as an Indian spiced chicken sandwich with mango chutney and a steak-and-eggs hash bowl. Fresh squeezed juices and cold brew coffee round out a meal. Breakfast, Brunch & Lunch daily. BrunchDTLA, Santee Court, 718 S. Los Angeles St., Ste. A, Los Angeles, CA 90014, 213-944-8326. Open since May 2016, Origin Café on Pico Boulevard offers breakfast, lunch and brunch with a stylish backdrop. The global (and kosher) menu, which utilizes seasonal, organic products, features the likes of shakshuka with preserved lemon and a sous-vide egg; lox Benedict with horseradish hollandaise; Moroccan-spiced salmon tacos; seared halibut with pineapple cucumber mint tzatziki; and roasted pumpkin with lime and green curry butter. Diners will also find high-end coffees and teas and sweets, including a brown butter bread pudding with date whipped cream. Origin Café, 8532 W. Pico Blvd., Los Angeles, CA 90035, 424-288-4682. Bestia alums Zach Negin and Daniel Flores will open wine bar Tabula Rasa on Hollywood Boulevard in East Hollywood. Tabula Rasa Bar, 5125 Hollywood Blvd. , Los Angeles, CA 90028, no phone. Hospitality group Knitting Factory Entertainment and the founders of Big Wangs and Tipsy Cow opened restaurant/bar El Tejano on July 26, 2016, in the NoHo Arts District. Expect an extensive Tex-Mex menu with an emphasis on specialty tacos and a range of salsas, along with favorites like Frito Pie, queso and chilis. There’s a large list of craft imported brews and domestic beer, as well as a vast selection of tequilas, mezcals and specialty margaritas. El Tejano, 11122 Magnolia Blvd., North Hollywood, CA 91601, 818-985-8787. Executive chef D. Brandon Walker and chef Jill Davie (Josie) will open neighborhood restaurant The Mar Vista. Walker --- who also serves as the executive chef of Bread and Roses Café, which feeds 750 homeless weekly --- will implement a 360° philanthropic business model, donating excess food to Bread and Roses Café and affording externship opportunities for students of the culinary training program he helms at St. Joseph’s Center. The Mar Vista will serve a menu of “progressive Los Angeles cuisine,” including dishes like lau lau with braised beef cheeks, white fish, smoked yucca, steamed collards and au jus. The Mar Vista, 12249 Venice Blvd., Los Angeles, CA 90066, 424-259-3093. Pico and Crenshaw is now home to the first LA location of Southern favorite Gus’s World Famous Fried Chicken, specializing in spicy, Memphis-style birds. Order pieces al la carte or as a plated meal. Starters and sides include fried pickles, fried okra, baked beans, mac 'n' cheese, collard greens and cole slaw. There’s soda and beer to drink and pie for dessert --- pecan, chess or sweet potato. Gus's World Famous Fried Chicken, 1262 Crenshaw Blvd., Los Angeles, CA 90018, 323-402-0232. Pastry chef Lincoln Carson (Superba Food + Bread) is creating traditional and gourmet versions of New Orleans’ famed doughnut, the beignet, at the new Beverly Hills Beignet. Expect classic powdered sugar treats alongside edgier versions made with pink Himalayan sea salt and caramel; dark chocolate with cayenne; Nueske bacon with maple bourbon honey dipping sauce; and roasted artichoke with lemon aioli. There’s French press coffee by the pot and lemonade to drink. 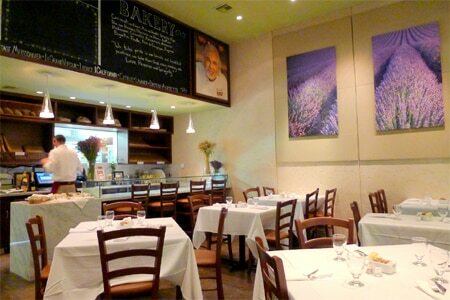 Beverly Hills Beignet, 9527 Santa Monica Blvd., Beverly Hills, CA 90210, 310-926-5873. At Magpies Softserve in Silver Lake, Chef Warren Schwartz (Patina, Westside Tavern) is whipping up handmade, gourmet ice cream in flavors like yuzu honey, green tea brown rice, and malted milk chocolate. Topping options include chocolate covered honeycomb and toasted maple coconut chips. Cold-brewed coffee floats are on offer, too. Magpies Softserve, 2660 Griffith Park Blvd., Los Angeles, CA 90039, 323-486-7094. Owners Philip Moses (Bestia, Ray's & Stark Bar) and Christopher Chi (Bestia, Blue Hill at Stone Barns) have launched their new gourmet food truck, Pico House. Find four grain bowls including Robertson Short Rib with beef bacon, pasilla puree, broccoli, swiss chard, radicchio, tomato chutney, and crispy shallots; Crenshaw Meatballs with pork & chicken meatball, coconut curry, garbanzo beans, jicama slaw, and honey roasted peanuts; Grandma’s Pork with gochujang braised pork shoulder, chrysanthemum purée, garlic confit, green kale, and sesame vinaigrette; and Union Lamb with harissa roasted lamb shoulder, carrot puree, cherry tomatoes, cucumber, mint, and goat cheese. Dave Woodall (Melisse, Blair’s) and wife Alexis Martin Woodall will open a stylish two-story restaurant, Red Herring, in Eagle Rock later this summer. Expect an American menu of small and large plates, plus wine and cocktails. Red Herring, 1661 Colorado Blvd., Los Angeles, CA 90041, no phone. Chef/owner Jonathan Yao (Coi, Alma) has opened Kato on Santa Monica Boulevard in West L.A., offering a refined selection of Japanese/Taiwanese dishes. Look for a five-course tasting menu with the likes of smoked hamachi with charred scallion and cucumber; beef tartare with garum, black garlic, kombu and yolk jam; and buttermilk pudding topped with guava ice. Dinner nightly. Kato, 11925 Santa Monica Blvd., Los Angeles, CA 90025, 424-535-3041. 71Above has opened on the 71st floor of the U.S. Bank Tower in downtown Los Angeles. Chef Vartan Abgaryan departed Cliff's Edge to helm the restaurant. 71Above, 633 W. Fifth St., Los Angeles, CA 90071, 213-712-2683. The Cannibal Beer & Butcher in Culver City has launched a new weekend brunch menu, available Saturdays and Sundays from 10 a.m to 3 p.m. Highlights include a "German Breakfast" charcuterie board, the "Cannibal Benedict" (crumpet, beef tartare, poached egg, béarnaise), Easter pie (a traditional Italian dish with meat and cheese in a pastry crust) and a green bloody Mary with fire roasted tomatillo. The Cannibal Beer & Butcher, Platform, 8850 Washington Ave., Culver City, CA 90232, 310-838-2783. Throughout July, owner/chefs Ramiro Arvizu and Jaime Martin del Campo are putting on an enchilada festival at their two restaurants, La Casita Mexicana and Mexicano. They’ll offer 14 varieties of enchiladas from various regions of Mexico. Think enchiladas made with white fish and capers, Oaxacan mole, potatoes and chorizo, corn and poblano chile. La Casita Mexicana, 4030 E. Gage Ave., Bell, CA 90201, 323-773-1898. Former Alma duo Ari Taymor and Ashleigh Parsons are taking over the kitchen at The Standard Hollywood following a harmonious residency there. Look for breakfast, lunch and dinner menus "inspired by the landscape and terroir of Southern California." Many fans hope that popular Alma dishes will reappear here, such as Taymor's seaweed and tofu beignets topped with yuzu koshu and lime; frozen foie gras with smoked maple, coffee granola and carrots; and Jidori chicken with chanterelle, apricot and vadouvan. Breakfast, Lunch and Dinner Daily. The Standard Hollywood, 8300 W. Sunset Blvd., West Hollywood, CA 90069, 323-650-9090. Chef Jesse Barber will depart Dudley Market at the end of July 2016. 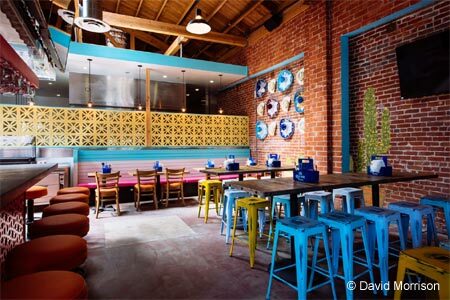 Dudley Market, 9 Dudley Ave., Venice, CA 90291, 424-744-8060. Executive chef Teresa Montaño has left Pasadena’s Ración to open a new L.A. restaurant in 2017. Her sous chef Shane Alvord is the new chef de cuisine. Racion, 119 W. Green St., Pasadena, CA 91105, 626-396-3090. The Culver City location of the healthful LYFE Kitchen has closed. Fans of the chain can visit the the Playa Vista store, which remains open. LYFE Kitchen, 9540 Washington Blvd., Culver City, CA 90232, no phone. Chef Alain Giraud's Maison Giraud closed on July 10, 2016, due to construction on the Palisades Village project. Maison Giraud, 1032 Swarthmore Ave., Pacific Palisades, CA 90272, no phone. Santa Monica's eLOVate Vegan Kitchen & Juicery has closed. eLOVate Vegan Kitchen & Juicery, 1705 Ocean Ave., Ste. 111, Santa Monica, CA 90401, no phone. Din Tai Fung’s historic first U.S. location will close on July 11, 2016, in Arcadia. Taiwanese dumpling lovers can head to the Din Tai Fung that will open the same week at the Westfield Santa Anita mall a few blocks away. There are also plenty of seats available at the newish location of Din Tai Fung at The Americana at Brand in Glendale. Din Tai Fung, 1108 S. Baldwin Ave., Arcadia, CA 91007, 626-574-7068. Haute cocktail bar The Fiscal Agent, upstairs from Studio City’s Barrel & Ashes, has closed. Plans to expand the barbecue restaurant into the space are already in the works. The Fiscal Agent, 11801 Ventura Blvd., Studio City, CA 91604, no phone. Phillip Frankland Lee’s popular Studio City restaurant The Gadarene Swine closed July 2, 2016 due to a partnership dispute. Lee hopes to open another plant-based restaurant in the future, but fans can still find some of his signature vegetarian dishes at Scratch Bar & Kitchen in Encino. The Gadarene Swine, 11266 Ventura Blvd., Studio City, CA 91604, no phone. Picnic LA, an upscale cafeteria-style spot in Culver City, has shuttered. Picnic LA, 9900 Culver Blvd., Culver City, CA 90323, no phone.